We have had a lot of hot and humid days this summer, so when Rosebud plays in the water table, I try to keep it in the shade. On this particular day, the sun had shifted and Rosebud was complaining of being hot. She still wanted to be outside so I suggested moving the table to a shady spot. She didn't want to, but obviously it was still a problem, so we had to find a solution. 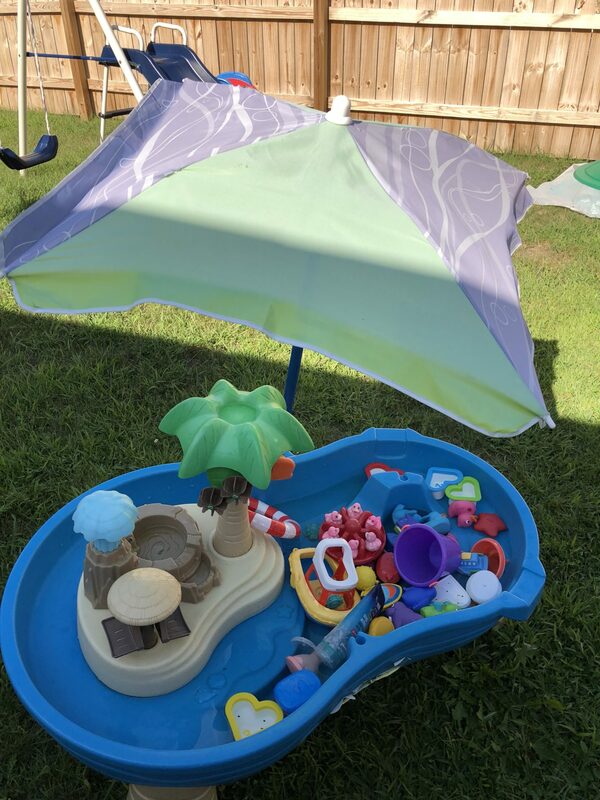 The umbrella that came with her picnic table was over her lawn chair, so she brought it over to the water table. I asked her how we could stand the umbrella up to cover the table. She tried putting it into the ground which didn't work. Then she noticed a little hole on the back of the water table that is meant for an umbrella. It fit, but slid all the way down and was too close to the table. I told her what we needed to do was to find a way for the umbrella to sit in the hole without falling all the way through. She suggested that we use tape, so I headed inside to check the junk drawer. I brought out some round rubber thing that must have been some sort of stopper. That was way too small. I showed her the rubber circle and how it wouldn't fit. We went back to the tape solution and duct tape did the trick, at least for a while. I put some tape on the bottom of the hole and the umbrella had something to sit on. Well, at least until Rosebud started splashing. If Rosebud can't reach something in the kitchen, she finds something to stand on. Usually, she finds her drum, but that has become unsafe so it disappeared. She's always looking for things in the house to use as a step stool. One day, she tried using an exercise ball and came crashing to the flor. Luckily I was right there and she didn't get hurt, but it definitely scared her. We all use some level of problem solving skills every day. Whether it's in our businesses, family lives and even in our hobbies. It's important that children have many opportunities to find solutions to their own problems. This can be with specific toys or just random things in their environment. I notice Rosebud's problem solving abilities most when we're not doing anything specific because the best learning opportunities naturally appear. They can appear when we're cooking dinner, creating art or playing outside. It's children's job to explore using trial and error to see what works. It's our job to ensure that they have plenty of opportunities to do this. Here are some ideas to get you started. 1. Put water in a bucket or water table with a variety of objects and different sized cups. They can learn about sinking and floating, less vs more and if an objects properties change in water. For example, a sponge or cotton ball will become heavier in water. The whole idea is for them to experiment and to see how things work. 2. Give them blocks of any kind and let them build whatever comes to mind. Rosebud likes to build castles, roads, cities and tree houses just to name a few. Bigger blocks get stacked on top of smaller blocks. Different shapes don't always work well together. 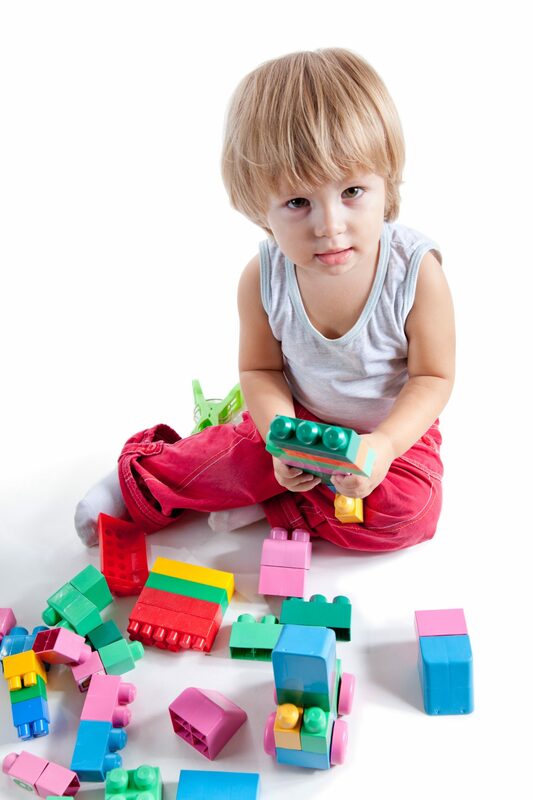 The blocks may not balance well depending on if you are building on carpet vs a hard floor. There are so many ways that blocks can be used for teaching and learning problem solving and logical skills. 3. Puzzles are good because children have to think about where the pieces go in relation to each other. While this is not open ended, puzzles can help children focus on a specific problem and solution. 4. 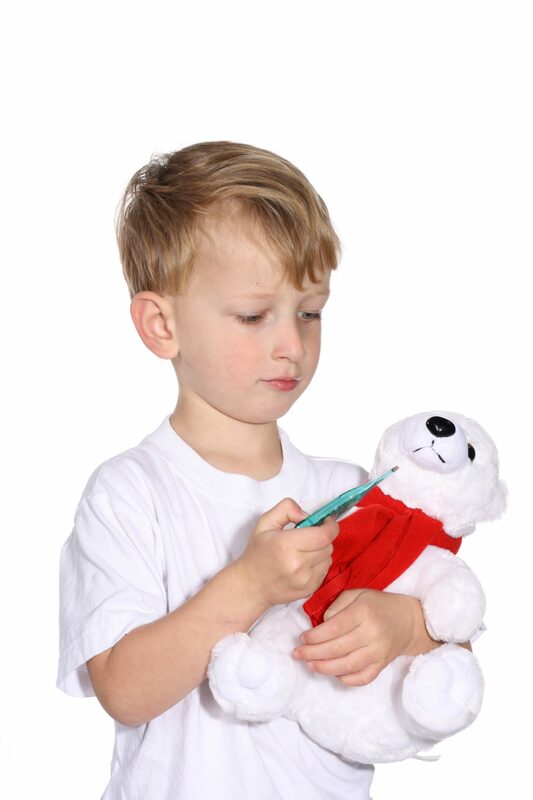 Any dramatic or aunt imaginative play can be used to encourage problem solving. When children play together, they have to decide who is playing what role. Around the preschool stage, they start planning and being more intentional about their play. They can work out turn taking, using an object to represent something totally unrelated and experiment with different roles and themes. Rosebud's favorite dramatic play theme is, doctor. I can't even count how many checkups I've had in the past year. 5. Let them experiment with a ball or marble run. Have different sized tubes. Change the tubes around with different lengths and curved tunnels. They can see how the marbles move depending on how the run is set up. One boy I was working with in the pre-k class was fixing his marble run. He was telling me how the pipe needed to be welded because there was a crack, so he took it apart and rebuilt it. He built his marble run quite tall and another boy was working on a way to reach the top of the marble run. These skills can be modeled and reinforced at any time. 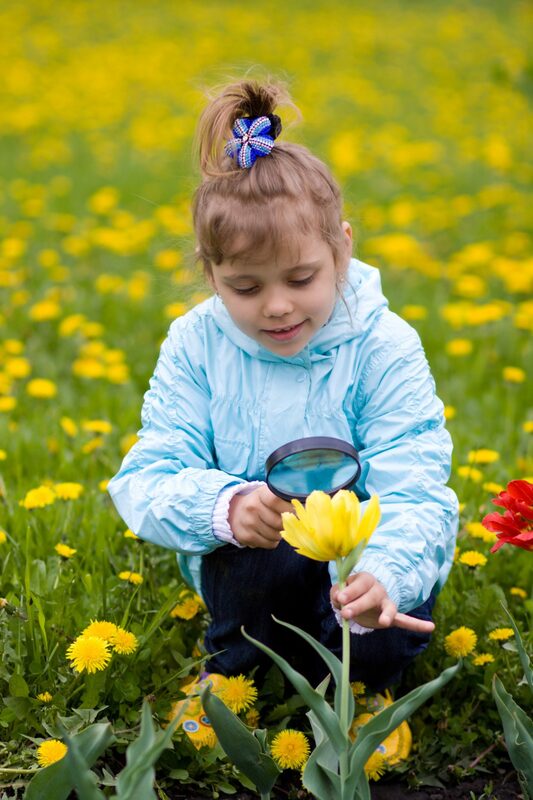 Children have a curiosity and drive to learn. Experimenting comes naturally to them and it definitely should be encouraged. You never know what discoveries they will make. For more great ideas and insight on this topic, click here. Love all these ideas! My kids love puzzles and blocks. That keeps them entertained for hours. Water play is another favorite but we need to get a new water table. Thanks for your suggestion! Thank you for visiting my blog and leaving a thoughtful comment.